Although air flows through the H80 from the rear to the front, with the two exhausts located just behind the propeller, it is a compact straight-flow design with no complex flow-reversal sections. General Electric is ranked as one of the world’s leading aero engine manufacturers, with a $20 billion business powering airliners, fighters and many other types of aircraft around the world, plus servicing and systems provision. Currently just $400 million of that annual business comes from the Business and General Aircraft (BGA) division, but the company has plans to dramatically expand in that sector, and in so doing is taking on the Pratt & Whitney Canada PT6 family that currently dominates the marketplace. That journey began in July 2008 when GE Aviation (Chalet B107 and Hall 2A Stand C252) acquired the Walter company. Founded in 1911 as a motorcycle and automobile engine manufacturer, Walter had produced more than 37,500 aero engines since it entered that market in 1923. At the time of its acquisition the principal product was the M601 turboprop, best known as the powerplant for the Let 410 19-seat airliner/utility transport, which is still in production at Kunovice by Aviation Industries (a Russian/Czech-owned company). GE’s first action with its new acquisition was to move the existing plant to more modern facilities, followed by a major investment in implementing a modern production line concept and new machines that can undertake advanced processes such as the manufacture of blisks. These are single-piece components that replace older engine stages that are traditionally made by attaching individual blades to a central ring. Today Kbely is a self-contained unit with 410 employees, a design department, overhaul capability and four test cells. While it continued to manufacture M601s, as it does today, the Kbely plant also began gearing up for an advanced derivative, the H80 family, which is based on the Walter design but with the insertion of advanced GE technology. “Walter was a great opportunity for us to move into the [turboprop] space,” recounted Stoker. “The M601 is a simple, robust and somewhat elegant design. We were able to take that and improve the 3-D aerodynamics, and improve the temperature properties of the materials.” At the heart of the H80 is the M601’s elegantly simple combustor, which is a “slinger” type that uses centrifugal force to produce a mist of fuel for ignition. The “slinger” is very compact, which in turn means the engine’s length can be kept short without the need for the complicated reverse-flow combustors used in other engines. Furthermore, as it lacks fuel nozzles, there is no need for regular and costly hot-section inspections. A new compressor section was designed, using two axial blisk stages ahead of a centrifugal third stage, and titanium replaced stainless steel. Advanced 3-D aerodynamic modeling was employed to produce a more efficient design. This was also used in the turbine section, as were new materials. Overall, the H80 shows a 4-percent better pressure ratio when compared with the M601, while specific fuel consumption is 8 percent lower. General Electric claims a reduction in operating costs of around 10 percent when compared with the PT6A-34/35 engine. Time between overhauls has risen from 3,000 to 3,600 hours, and power output has been improved from 750 to 850 shp. In fact, the basic engine is available with three different power ratings (750, 800 and 850 shp) and is known as the H75, H80 and H85, respectively. Development of the H80 family got under way in January 2009. Later in the year it achieved its first commercial success by being selected by Thrush for the 510G agricultural aircraft, and a first example took to the air in 2010. That year the H80 was selected by Aircraft Industries to power all new-production Let 410s, and by the end of 2011 the engine had been certified by EASA. Many other certifications followed, including FAA approval for the H80. FAA certifications for the H75 and H85 are due imminently. As well as these aircraft, the GE engine has already been selected for two more new types. The Russian Technoavia Rysachok will feature H80s for production machines, and is due to fly with its intended engine in the third quarter of this year. The first H85 application is the Caiga Primus 150 being developed in China as a 5-seat high-flying business aircraft. Meanwhile, the engine is available as a retrofit. 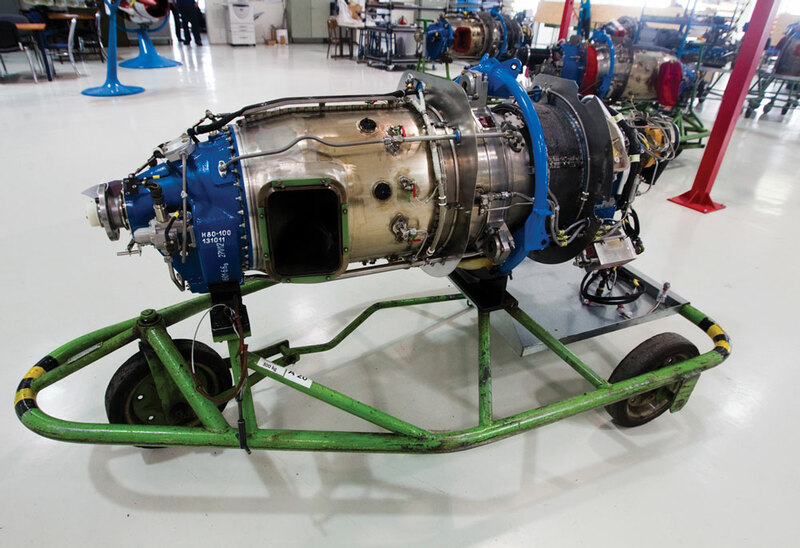 Smyrna Air Center has developed the Power90 engine upgrade for the King Air C90 with H80s under a supplemental type certificate, and Air-Tec in South Africa is due to receive an STC for an H75 upgrade for older Let 410s. The original M601-powered aircraft have some rudder restrictions that prevent them from being re-engined with the more powerful H80 that is now used in new-build Let 410s. In April this year the 50th H80-series engine was delivered, and the 100th is due before the end of the year, with production running at about two per week. The factory employs a modern production line process, and has a capacity of around 250 engines per year. That can be increased if required. As well as building new engines, the facility undertakes deep maintenance and overhauls on existing M601s. Around 650 of these engines are in worldwide service, with 44 percent flying in Europe and Russia, while another 300 or so M601s are in use but are considered outside of General Electric’s purview. General Electric has implemented a new support service for the H80 family, based on a one-call service with web-based tools, AOG teams and 24/7 coverage. A global network is growing, beginning with a U.S. center and then new facilities in South America, South Africa (Air-Tec) and Russia (Sokol). A center is being established in China, initially to support the Thrush 510G aircraft being delivered to Beidahuang, and it will be operational before the end of the year. Another center is to open in Australia to support operators in Southeast Asia.